Who are Angels, What are Angels, Why are They? What is going to happen next in really tremendously world shaking events? Now we're living in the pulsating, very complicated and fast-moving twentieth century. Never have events in all of the history of mankind, never have they been as they are today. The events of everyday now are so exciting that they would have been big banner news headlines about seventy-five years ago — or even fifty or sixty years ago. But I mean now the big news that will be world shaking news, bigger than the ordinary daily news. What's going to happen next — if you could only know — and you can know. Now there is a book that records the great world shaking events far in advance. And I'm referring to the world's number one seller. More people have it than any other book. I'm referring to the Bible. But very few understand it. Bruce Barton said it's the book that nobody knows. And it certainly is the book that nobody knows. Few read it; fewer still understand it. And of those, even fewer still believe it. In other words it is the Word of God. Many people believe in God. People say, "Oh I believe in God." But the question is; do they believe God, because the Bible is God speaking? And I find that very few believe God. Now you read in the Bible, back in the very first chapter and the second chapter and the third chapter, of Adam and Eve, the first humans. They were talking with God; God in person was instructing them. But they didn't believe God; they didn't believe what He said. Satan came along in the form of a serpent. They did believe him. But they didn't believe God; very few do today. Well that's the situation. 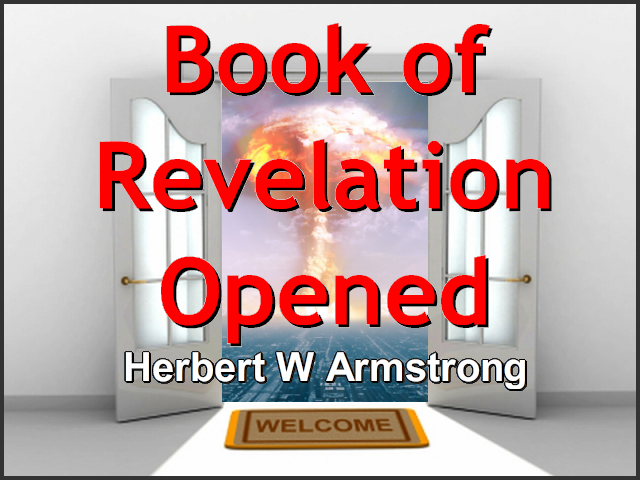 But in this wonderful book, the most mysterious, the least understood of all — and it is the most mysterious because it has been closed and sealed till now — is the book of Revelation, the last book in the Bible. And that is, mostly, disclosing events that are yet future. It has been closed and sealed until now, because it wasn't intended for human beings to understand it until now. But God's time has come. The time has come when the world needs to know what it does reveal. The time has come when the seals are stripped from that book. And it is open to our knowledge and our understanding. And this voice is crying out with the warning that that gives to the world. I'm going to open that book to you just now — that Book of Revelation. It's the most marvelous book that has ever been written, the least understood, apparently the most mysterious. And one reason it is so mysterious is because it is, primarily, written in symbol. But the Bible explains its own symbols. People will say, "Well, that's just your interpretation." No, you don't need to interpret it at all. The Bible interprets itself. I will show you right in the first chapter an example of that. Now first I have here my Bible, which is the King James translation. I use it because most people have it. There are other modern translations. Perhaps the Revised Standard may be even more accurate. The Moffatt translation makes the meaning clearer, only I think it is not quite as accurate. But wherever it is accurate, it makes the meaning very clear in modern language. But I still use the old King James language. You know it reminds me of what one person said one time. She was an elderly lady and she said, "Well I still like that King James Bible." She says, "If it was good enough for Jesus, it's good enough for me." Well, you know, the King James Bible was not translated into English until the year 1611 and that is about a thousand six hundred years, almost, after Jesus. But that dear old lady didn't know that. However it is the Bible translated into English and the English language, and it was translated in the year of 1611. It is the translation that is used by most people. And so I'm using that at this time. Now I have here printed up above the actual Word of God it says, "The Revelation of Saint John the Divine." "The Revelation of Jesus Christ to Saint John" or, in my Bible, often I see it does say, "The Revelation of Saint John the Divine." I hadn't read this before, but I see right now in my own Bible it says, "The Revelation of Jesus Christ to Saint John." That's exactly correct; that is what it is. It is not the revelation of any Saint John the Divine, because John was not divine. He was a saint, but he was not divine. And he is not the revealer. Now revelation means, 'opening up to understanding,' not, 'closing.' It means, 'revealing,' not, 'concealing.' But let's begin with the Bible itself, this mysterious book. You've heard about it; you've never heard it opened up or explained. So open up your ears and listen. Now do you notice there are three things there mentioned that he's recording here? When you read the book, you're reading three things that John recorded. He is recording here the Word of God; it's part of the Word of God. The whole Bible is the Word of God. So this is part of the Word of God. And, secondly, the testimony of Jesus Christ. Jesus Christ is the faithful witness, as you read down in verse seven, or verse five, I should say. And it is the testimony of Jesus Christ. Now testimony is what someone will testify or report or say. You put a witness on the witness stand in a trial of some kind and the witness gives his testimony of what he saw, of what he knows, and he gives that before the jury and the judge. And so it is the testimony of Jesus Christ, what He will testify. Well let's just say that Jesus Christ, then, is put on the witness stand and He is testifying in here the things of God and what is shortly going to come to pass. Now why does it say, 'shortly?' Let me just tell you something. You can call this my own theory if you want to. The Bible has not been understood; the Bible can be understood today. I believe, and I say, "I believe," I don't say that very often. I speak with authority, but right now I'm giving you my opinion. I'm not speaking by authority, but it's my opinion: I believe that the Bible primarily was written for, and intended for, this living generation, because it was not understood by previous generations. It had never been understood. It was not distributed very widely until after printing was discovered back about, let me see, about the fifteenth century or something like that. The King James Bible was produced not too long after printing had been discovered, and that was 1611. And knowledge began to increase after that. Before that, the only Bibles were Bibles written by hand. And people only had one book at a time. Someone might have the book of Isaiah; someone might have the book of Matthew; someone else might have had the book of Revelation, but he didn't understand it if he did. And so it finally was printed all together. Now between 1611 and this time, mostly in the nineteenth century, just before our century, there were many scholars who wrote many things about the Bible: the commentaries that go through, well, almost every verse in the Bible, beginning in the Old Testament with Genesis and going through the Bible and expounding verse-by-verse what is in the Bible. And they're not too reliable I find, because they didn't understand. And so, at the same time, there were concordances that will give you a word and show you every place in the Bible that word is used. And you can find anything you want, if you know the word you want, through a concordance and find where it is in the Bible. There are Bible encyclopedias; there are Bible histories; there are many, many works that scholars use about the Bible. Mostly they are intellectual and scholarly and written by men who really did not have spiritual understanding. And they're not as helpful as they might be, but they do give us a help. And many of these things could not be understood, though, and still, many of those more-or-less scholarly and technical details were written out and made available through print for all of us. So now let's get back to this. There are three things recorded here in this book: first, the Word of God, and then, the testimony of Jesus Christ, and then all of the things that John saw. Now John saw these things in a vision. And, really, 'The Revelation' is what he saw; primarily that's what it contains; that's the main bulk of the book. But it also contains the Word of God. It is the Word of God. And it contains the testimony of Jesus. Now if you have a red-letter Bible, and this one I have happens to be. I wish it weren't. I would rather it wasn't because I know when Jesus is speaking and when He isn't. But nevertheless, and it makes it a little more difficult for me to read, but it does contain the words of Jesus: His own direct testimony and His own word. But primarily it is what John saw in vision. Now, the time was not at hand before, because the book wasn't understood, but now the book is understood. The time has come and God has called and raised up this voice to cry out and make that clear and make that plain to the world today. He is speaking of Jesus Christ. Jesus Christ was; He is, and He is alive as High Priest in heaven. A lot of people wonder, "What happened to Christ?" Well He died, but He was resurrected and He went to heaven after that. "Well what's He been doing since? You don't think He's still dead, do you?" Oh no, Jesus Christ has been alive these more than 1900 years. But He's been in heaven as the High Priest for His people, the Church. And that's most of that part of His ministry which is in heaven now and not on earth, is recorded in the book of Hebrews. Some years ago I went through a long series where I went through, verse-by-verse and chapter-by-chapter, the book of Hebrews. It was an interesting series and I enjoyed doing it. And I believe many enjoyed hearing it. But anyway, it is Him "which is, and was, and is to come." And that's Christ, because He is eternal from eternity. He had no father, no mother originally. And He was with God. But then He became born as a human being, not of a human father, but God was His Father, and Mary, a human, was His mother. He was both God and man. Now He is to come again. He went to heaven. He is High Priest; that is His job; that's His mission now. He is coming again as King of kings and Lord of lords to deliver this world from our troubles that we're in. We're going to have delivery. And God help us if we didn't have that assurance. I don't know what would happen, because the weapons of mass destruction now exist that can wipe out all human life, can erase human life, from off this planet. And there has never been a weapon devised, yet, that was not used. Now we're just living in faith and confidence in human beings that they'll be afraid to use the nuclear power that could wipe us all, and erase us, off the face of this earth. Well I tell you I think we need some greater faith than just men, because some man would pull the wrong plug sometime and something would happen to us. Anyway, he gives this blessing and that is an introduction. Now I want to skip real quickly on to verse ten which gives you the setting of the entire book. Here is the subject of the entire book. That's the only place in the New Testament where, in the Greek language — in which the New Testament was originally written — where that word, "Lord's day," is ever used. If He is Lord of the Sabbath, the Sabbath is the Lord's Day, isn't it? Well, that is the day before Sunday, incidentally. That's just a little thing I'm going to clear up right here as we go along. That may startle some of you. Now I tell you, if you ask me, "Is Saturday my day?" I'll say, "No, Sunday is. Sunday is my day, if that gives you any comfort. But also Monday is, and Tuesday, and Wednesday, and Thursday, and Friday; they're all my day." But Jesus said that the Sabbath is His day; it is the Lord's day. A lot of people never quite understood that. Well regardless of that let's go right on: "In the Spirit." In other words, in vision, in the Spirit he was taken into the Day of the Lord. Now that's a time yet to come; that time hasn't come. And that's what this book is all about. It's all about the day of the Lord, which hasn't come yet. And it is coming very soon now. That's why I say the time has come for this book to open up. It's about the Day of the Lord, and the Day of the Lord is not come yet. It's going to come in our time in a very, very few years. I don't think the Day of the Lord will come within, say, three and a half to five years. I can't set any date, but I don't think it can come sooner than that. But it's going to come comparatively soon. Now then we have the setting. The whole book is about the time of the day of the Lord. We've been in the day of man. Or, if you want to be a little more accurate, it isn't fashionable, today, to believe that there is a devil, but this has been the day of Satan, believe me. For six thousand years now it has been the day of Satan, because Satan has swayed mankind into the way that is causing mankind a great deal of trouble. Oh, man has done some marvelous things, especially in this twentieth century, in science and technology and industry, some wonderful things that we have done: sent men to the moon and back. We had photographs sent to us from right on the surface of Mars, and close-ups of Jupiter and Saturn, mind-boggling things that are marvelous. But they're all physical, material things. But we can't understand our problems, our troubles. And we can't solve them because we are materially minded. And education is materialistic; and our problems are spiritual in nature and we just don't understand them. Well let's go on. Now we come to chapter two and three where it is Christ, Himself, speaking to the seven churches that were in Asia. I would just explain that these seven churches, actually, were seven churches that were on, at that time — at the time this was written: between 31 and 90 AD when John wrote this — it was like a mail route. And it started at Ephesus, the town of Ephesus. And so the first is addressed to the church at Ephesus. And next was the church of Smyrna, and so on. And finally it gets around to the church of Philadelphia and ends up with the church of Laodicea, like a horseshoe and it comes on around, like a horseshoe, down back not too far from where it started. And that is referring to seven different epochs, or seven different eras, of the church and of outstanding characteristics of God's Church during those eras. On the other hand, it is referring to seven different circumstances that would happen in the Church at the beginning and at the middle and at the end and all along. And so it really covers both the Ephesus condition that has been in the church all along, and so has the Laodicean condition: a lukewarm, sleepy, lackadaisical spiritual condition. And that has been in the Church all along. But it is to be the one which will dominate in the Laodicean era and, incidentally, the Laodicean era has not yet come. It is going to come and it won't last long. It's going to come very soon; it's going to be born in a time that I'm going to show you, that is revealed here, very, very soon. Now then, those two chapters — two and three — I'm going to pass over because it's merely a message to those churches. I want to get to the prophecy. Now this is what he saw in a vision. He was on the Isle of Patmos on this earth. But in vision, he seemed to be in heaven. Now there are three heavens mentioned in the Bible: the first heaven is the air. I fly in my airplane in the air; the birds fly in the air — in the atmosphere. There is a second heaven which is beyond the atmosphere, I don't mean the atmosphere, I mean it's outer space. The moon is in that heaven and Mars and Jupiter and other galaxies are in that heaven. But the third heaven is the heaven of God's throne. It doesn't mean that that is necessarily farther away, either. It is not described in the Bible. We don't know just where God's heaven is. Now who was that on the throne? We don't need to go on to the rest of that; read it yourself! You need it; it's good, but I don't have time. I just want to get to the actual prophecy and what's going to happen, the thing that I want to get to you. Now another translation of that, more modern translations would be, "a scroll," because books used to be one great long sheet just rolled up in a scroll and it was sealed: rolled up and sealed, sealed so you couldn't open it. And it was written on both sides. Maybe it was some skin of some kind, or papyrus or something. So the prophecy is in the book and it was sealed. "And I saw a strong angel proclaiming with a loud voice, Who is worthy to open the book [or the scroll] and to loose the seals thereof?" (Revelation 5:2) Strip the seals off so you can really read it and who can reveal its meaning and its understanding. So Christ, and He only, was able to loose the seals of the book. Now we come to the sixth chapter. And six of the seals were opened in the sixth chapter. There are seven seals altogether in the entire book. So the first thing we come to in the sixth chapter that he saw, when the Lamb opened the seals, he saw four horses: a white horse, and a red horse, and a pale horse, and a black horse, and so on. Now what were those horses? You've heard of the "four horsemen" a great deal. Now I'm going to explain that, but I see time's about run out and I'm going to have to defer that. What are those four horsemen; and what happens after that, because the day of the Lord comes after those four horsemen, even? And it's a very exciting thing. Now then, this book of Revelation is now opened to our understanding for the first time; now you can understand the book of Revelation and it is made plain and clear. It is the revelation of Jesus Christ. Where does Jesus reveal it? He does not reveal it in the book of Revelation. You have to look somewhere else in the Bible to find out where Jesus reveals the book of Revelation. I was going to tell you why it speaks in symbols; I didn't get to that now. But in the very first chapter it explains about stars and candlesticks. And they're only symbols, but it explains right there what they are. But Jesus is the One who opens it up and you have to go to the words of Jesus in Matthew 24, and in Mark 13, and in Luke 21. And there, Jesus, Himself, explains things that are the explanation of those six seals, as a matter of fact, of all seven seals of the book of Revelation. Then you can begin to understand the book of Revelation. Now listen, we have nothing to sell. I preach the way of give, not get. And we practice what we preach, believe me. You have never heard me make an appeal for contributions or funds on the air, or in print, to the public. I just don't do that. I would like to give you a book that explains a great deal of it; it is, 'The Book of Revelation Unveiled at Last,' This is a book that unveils the book of Revelation. It's about forty-eight pages and it will explain the book of Revelation so that you can understand it. This gives you a key and an outline of the book of Revelation. It has never been understood; the time has come when it can be opened up and understood. I'd like you to have it; I'd like to send it. There's no charge; there's no price. And we have nothing to sell. And we don't solicit contributions of the public, either on the air or otherwise, never contributions from the public. All you do is write and ask for, 'The Book of Revelation Unveiled at Last,' we'll know what you mean. We believe in giving, so, until next time, "Goodbye, friends."